On Tuesday, February 5, 2018 SpaceXâ€™s Falcon Heavy rocket lifted off from Kennedy Space Center in Florida. Instead of the usual concrete block for a test payload, the Falcon Heavy launched Elon Muskâ€™s Tesla Roadster and a mannequin called Starman toward Mars. Two and a half minutes after lift-off, the booster rockets returned for nearly simultaneous vertical landings. The event was visually spectacular. 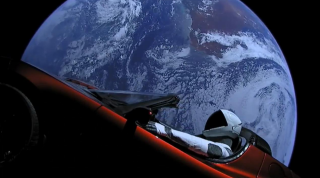 This photo collection follows lift-off to the last image of Starman and his Tesla as he begins his billion year journey to Mars, the asteroid belt, and around the sun.